I love peeking into other people's classrooms. Here is your invitation to peek into mine. My goal is to make our classroom a welcoming place for my students and their families. I want it to be a backdrop for the kids' learning and their work. I want it to pique their curiosity without being overwhelming. I want it to be about the kids who spend a year learning and growing in kindergarten. As you come in the outside exit -- here is our classroom. We use our sand table as "command central" in the morning. This is where the kids mail their names or sign in, where I put lost and found items for parents to claim and where any returned notes or papers. Right now, our sand table is filled with paper and scissors for cutting practice. To the right of the outside door we have learning activity bins and our line up dots. (Any shelf covered with a curtain holds toys for play time. Using curtains softens our space and reduces visual clutter.) I love how our line up dots make getting ready to go outside more orderly and adds number fun while we are waiting. We don't have any cosy nooks and crannies in the classroom, so we just have to declare a corner to be cosy. This is our quiet cosy corner for children who need a quiet zone to read a book, chat quietly or just ponder life. The braided rug and the curtain (hiding teacher books and equipment) were summer projects. The lamp was a thrift store treasure. Our beautiful Waldorf style arch (christened "the rainbow" by the kids a couple of years ago) stores loose parts and provides a base for innumerable games and worlds of the imagination. The dramatic play centre is referred to by the kids as "the house" even when it is filled with space and astronaut toys or set up as a pizza restaurant. The tree changes according to the season and our whim. The dress ups (just "outside" this picture) are "closed" right now. We need to get a bit better at tidying the mess we make playing with the toys that are currently available before even more are added to the mix. Skirting the edge of the house area is a new acquisition. A cosy, curl up in it, chair. The calendar area and routine has been switched up a bit this year. I backed the calendar area with a warm tan broadcloth to make it a focal point. Instead of the traditional calendar, we are using a full year calendar as a living document that is up all year. I am learning as I go; luckily some wonderful educators (Matt Gomez and Mardelle Sauerborn) are farther along this calendar adventure than I am and happily share their expertise. We still count the days in school and graph the weather. Our weather graph goes to 10 - giving us lots of opportunity to make addition facts to 10. I usually sit on the stools when we are reading or learning together at the carpet. Two stools is the happy medium between what my knees can tolerate and being at the same level as the kids. Our internal door is right next to our carpet area. From the door you can see shelves housing puzzles and art materials, our class tables and the white board. We love our digital projector. Hidden by the white board and the cloak room is a science discovery area. We keep our science-y books there and interesting things to investigate. Right now, we have a selection of ornamental gourds. Thanks for joining our classroom tour. I can tell you put a lot of thought into how your classroom was laid out. I really like all the elements of nature you've brought in. Thanks for sharing! It's a constant evolution. Just looking at the pictures of the room, I have already made some changes. It was good to get a bit removed from the room to really "see" it. My name is Tiffany Wake from the University of South Alabama. I am in EDM310, and we are required to comment on certain blogs. First I must say, your classroom looks great! I love that even though you don't have all of the special things, like a nook for reading, you took the time to make one. I think your ideas of making the classroom a fun and cozy environment for the students are awesome. I especially like the number dots for lining up as they could be used for help with numbers as well. I hope to ensure my students can be as happy and comfortable in my classroom as yours seem to be. The number dots are a sanity saver. I love mine! Hi Ms. Purdell-Lewis! I'm Kyle, an EDM310 student from the University of South Alabama. I love the "command central" you have set up in your class. I think it's great to give the kids a focal point to come and get their bearings. I totally agree about the cloak area, as well. What a waste of learning space, huh? I really enjoyed your post and I would love to have my kids in a classroom like yours. Happy Thanksgiving! When we are in charge of school design, we will decree that all cloak room areas are outside the classroom area. And, while we are at it, we might as well say that teachers will have their own little office in a little room connected to the classroom. Then the whole classroom will belong to the kids. Hello! My name is Brooke Allen, and I am a student at the University of South Alabama, like Kyle and Tiffany who commented earlier. I am currently in EDM310 with them. I love your classroom. I like the idea of displaying a full year calendar instead of a monthly one. I'm going to look into the links you shared to learn more about that! I also like your reading nook a lot. I think it is very important for a classroom to feel comfortable for students, and you certainly accomplished that. Thanks for sharing the pictures and ideas! I am excited to try a new way of "doing calendar" with my students this year. Maybe it is something you will try when you have your own classroom. Hey! My name is Jessica Mayo, and I am a student at the University of South Alabama. I am in Dr. Strange's EDM310 class. Your classroom looks amazing, I can tell that you put a lot of hard work into it. Something that I really loved about your classroom was the "cozy corner", where students can read a book or have a minute to themselves. It is something that I want to incorrperate into my classroom when I am a teacher. I like how you made the classroom look child and parent friendly that is something that I want my future classroom to have. Thanks for the ideas and pictures that you shared!! I have to admit that I am pretty pleased with the cosy corner too. I quite beam with delight when I see a kid or two curled up there chatting or sharing a book. Hi Miss Purdell-Lewis! I am a student at the University of South Alabama. I am in Dr. Strange's EDM 310 class. I really enjoyed the virtual tour of your classroom. I would have to say that one of my many favorite parts of your classroom was the dots for the children to line up on. From experience, that is one of the most chaotic times in a classroom. I think the dots would help control some of that chaos. I also love all of the interesting centers you have in your classroom. I love how the children are not limited to doing one activity in a center. They can use their imagination and create their own games and activities. The reading center was a center that especially stuck out to me. The fact it isn't just for reading, but for pondering and quiet discussions is great! I also love that in your science center you have gourds to investigate, keeping up with the seasons. I truly enjoyed this post and could see myself using some of these ideas in my classroom!! Happy late Thanksgiving. Transition times are always opportunities for foolishness. Whatever I can do to make them easier for all of us - I will do! I love open ended activities. 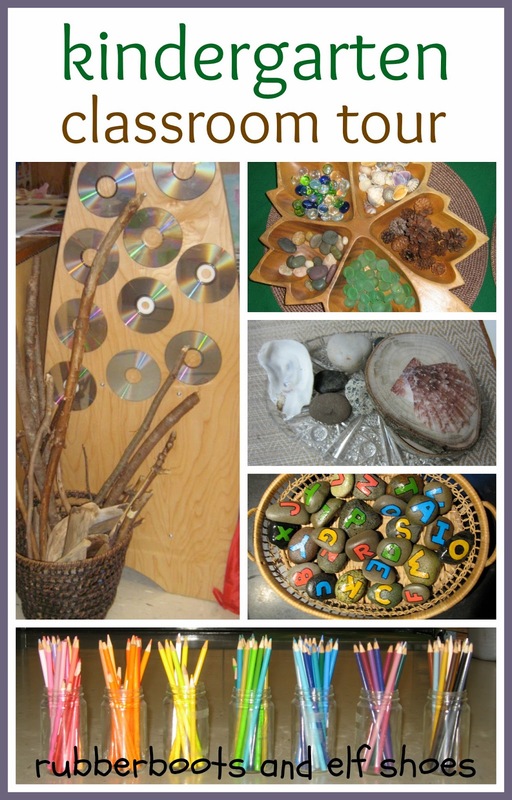 If it is something that you are interested in, google "loose parts". Hi Ms. Purdell-Lewis! I am also in EDM310 at the University of South Alabama. I loved the tour of classroom and it is inspiring to see how you made everything work in your classroom with what you have! Your's is one of the bigger classrooms I have seen and I made notes of a few really great ideas that I would love to incorporate into my future classroom. 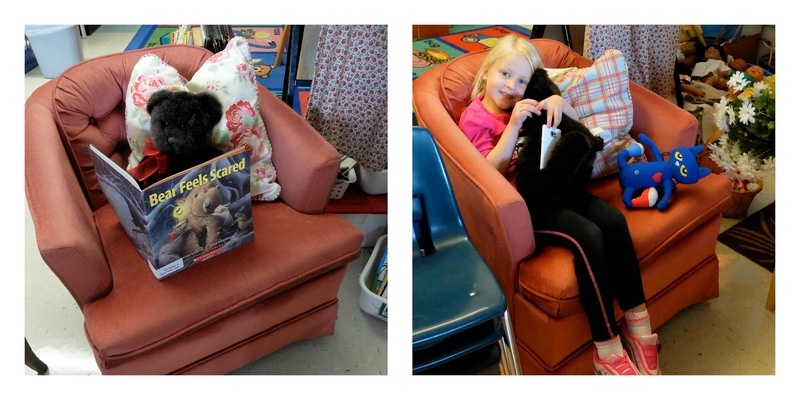 My favorite was the idea of having a "Cozy Corner" for reading! I always loved to read but I probably would have read more at school if I had an awesome place to curl up with pillows and other unclassroom-like things! My other favorite thing was the tree that changes with the seasons. This would be a great way to incorporate the seasons and weather lessons over time and to possibly teach the kids about the different parts of plants and plant growth over time! Thanks for sharing! I think the photos make my classroom look bigger than it it. I am in a fairly new school. Here, the newer the school, the smaller the classrooms. I like the tree too. It is on my "to do" list to make a tree - maybe from scrunched up brown craft paper. I would like one that did not come from a package from a teacher supply store. I need a student to have a crafty parent who wants to make me a tree!! Your classroom is amazing! I am a student in learning to become a teacher and I really enjoyed reading about your classroom and every nook and cranny of it. Although I will be teaching high school, I still want to be able to take some things away from your classroom to get my kids excited about their learning environment. I love how full your classroom is with anything and everything that can help facilitate your student's learning. My favorite part was the science discovery area. I have seen pictures of high school classrooms that are very coffee shop like - creating work areas with tables and chairs rather than desks in rows. Very cool. Hi. My name is Breanna McCormack. I'm also a student at the University of South Alabama in EDM310. Your classroom is awesome!! It is great to actually see another teacher's classroom and how you do things with your students. I love how you take what you have and make it into something child-like and cute for the classroom. The cosy corner is nice. We all need a little quiet time every now and then :) I also love the line up dots. It is very organized, but a good learning experience for the kids. The tour of your classroom was great and very inspiring. I love peeking into classrooms and seeing how other teachers make things work for them. There are always good ideas to steal - share. Hi Ms. Purdell-Lewis, I love your classroom!! I am in EDM310 at the University of South Alabama. I love how you have made your classroom feel cozy for your students and parents. I really like the "cozy corner" that you have in your class. When I was in school, my class had a "cozy corner" and I loved it. The cozy corner allows students to go to a quiet place to relax and calm down. Also, the "cloakroom" is a great idea. Thank you for sharing your classroom!! Everyone needs a bit of quiet in a noisy day. Today the cozy corner was covered with animals climbing mountains. All good!! I am Ashlyn Hubbard, also an EDM 310 student at the University of South Alabama. Your classroom looks so cute! It is very casual and creative. Thank you for giving me ideas! Having a fun, comfortable class for the kids, really gets them involved and excited about learning. I love your "Cozy Corner" reading idea. Many of my teachers did something similar to this when I was elementary, and it really made reading more fun for us. It was a time to take a break away from school, and give us a little time to rest and read. I will definitely have a Cozy Corner in my classroom. I believe it is very important to have things your kids enjoy in your class, because it keeps them interested and involved in the classroom. Thank you for sharing your ideas! They are so cute, and I will definitely use them in my classroom! I believe that it is very important for students to have a learning environment where they feel that they can "fit in". And where they are not too distracted by the decor to learn. I know that my son would have been very unimpressed to be in a classroom full of pink chevron with black polka dot accents. Keeping it simple and gender neutral is important. Hello! My name is Kela Miller and I am also a student in EDM310 at USA. Your classroom is so interesting! I absolutely love the size of your room and how you have used every bit of it to enhance your students' time at school. How a classroom is set up really does make a difference. Thank you so much for sharing. Every teacher spends hours arranging furniture and figuring out traffic patterns and lines of sight when they move into a new classroom. It is important. Hey! I'm a student at South Alabama as well. It seems like you've really made use of the space that you have, and made it a really great learning environment for your students. I especially like the line dots you have on your floor. As simple as it is, that's something I haven't thought of or seen before. Having the children line up on their dots must be really helpful in controlling the chaos. In addition, the little "house" area is such a cute idea. That gives the kids an opportunity to use their imaginations and take a break from school work. to read (the letters are symbols that represent sounds which represent meaning). Hey! I am a student at the University of South Alabama, in EDM310. I love your classroom!! I think it is a great environment for the children. We had a cozy corner in my class room when I was younger, it was a great little area, good for relaxing after being on the play ground. I think your cloak closet is a neat idea for structure and organization! I enjoyed looking at your classroom! You were lucky to have a cozy corner when you were in school. I had rows of desks - maybe that's why I feel that it is very important to have an environment where children can feel physically and emotionally comfortable. Hi Ms. Purdell-Lewis! My name is Taylor Anglado and I am a student in Dr. Strange's EDM 310 class at The University of South Alabama. I absolutely love your classroom! It is cute and comfortable all at the same time. I think that it is very important to create an environment that your students will be comfortable spending every day in. It definitely seems that you have accomplished that. I can only hope that I can do so as well as you have in my future classroom! You have some very neat ideas that I hope to use in my classroom one day. I even pinned a few of the ideas to my teaching Pinterest board since you have made that an option! Thank you so much for sharing your wonderful classroom. I look forward to seeing more of your posts in the future. P.S. I hope you had a wonderful Thanksgiving yesterday! Pinterest is a godsend for teachers! What did we all do before Pinterest?!! Hi Ms. Purdell-Lewis! My name is MeLeah Miller, and I am a student in EDM310 at the University of South Alabama. I love your classroom! It looks so neat and cozy. I love all of your ideas, but I especially love the Line Up Dots! Like you said, it is a great way to practice numbers, and it makes lining up easier. I definitely want to use this idea in my future classroom. I think it is very important that teachers make the classroom a comfortable place for students, and you have certainly gone above and beyond with yours! Thank you for sharing your classroom, and I hope you had a wonderful Thanksgiving! I think it is important that the student's needs (even if they can't articulate it as a need) are given priority over teacher's decorating wants. Hello! My name is Meagan Jones, and I am also a student in EDM 310 at the University of South Alabama. I am in love with your classroom! It seems rather large! It is so cozy and comfortable! Your classroom is very well put together and organized. I hope and pray my classroom will be that neat in the future! I've pinned some of your ideas on my board on Pintrest, so thank you for those future ideas for my future classroom! Although the coat and shoe shelves are small, they seem to come in handy! Cannot wait to follow some posts of yours as I continue my education to become a teacher! Also, I know that Thanksgiving just came in Canada, so I hope you had a Happy Thanksgiving! I wish that I did not use the top of the coat cubbies for storage. I would much rather that it was display area or nice and empty. Unfortunately, there is never enough storage in schools - especially for primary teachers who "need" so much "stuff". Hi Ms. Purdell-Lewis! My name is Sarah Byrd, and I am a student at The University of South Alabama in Dr. Strange's EDM310 class. It's really neat to see that you are so excited about decorating your classroom, because I soon will decorating away my very own classroom! My Pinterest boards are ridiculous. I love your cubby area where students can put jackets, books, and backpacks. Thank you so much for sharing your room with the world, and I also hope you had a very happy Thanksgivings. Pinterest is wonderful for collecting ideas. Pin like mad to "save" everything that catches your eye. Hi! I'm in EDM310 at South Alabama and we were told to comment on your latest post. I loved this post! It was so interesting to see all the different parts of your room. It's so awesome to see someone that is so invested in teaching kids that they've thought out every detail of their room. I would have so loved to be in a room like this in kindergarten! I really loved your ideas like covering distracting areas like toys and things with a curtain. Kids so easily get distracted from learning so that's a great way to teach them that when they focus hard during class, they can play hard later. I just loved all the elements of your room. I hope your turkey day was yummy and fun! Heather, I started off as a high school English teacher - you never know where you might end up!! this is Rhythm. I am not in Alabama. I am in Texas. But I love your classroom too. I love that your kids take their shoes off! Rhythm, you make me laugh. Real out loud my husband asking what is so funny laughter. A scratch behind the ears and a juicy bone for you. Hello Sani. I am Melissa Keeler from the University of South Alabama, in EDM310. I am studying to be an upper level educator of history. I absolutely love what you have done with the limited space you have been given. The thought put into the play area is evident and exciting to see. I wish my son would have had you as his K teacher. I am a firm believer of play being so very important in the learning of young children (and old learners as well such as myself). I am also impressed with your cozy area. It is very warm and inviting. The children you teach are blessed to have such an imaginative and caring teacher. I wish you Happy Thanksgiving, we do not celebrate Thanksgiving in the States until later in November. November 27th this year. Thank you for allowing all of us to see what education CAN be. Fun, Imaginative, Comfortable, and Non threatening. I realize that teaching upper level is different however, I hope to be able to turn every space into a learning space as you have. You never know where you might end up; I trained as a high school English teacher. The same philosophy - fun, imagination, comfort and non-threatening can be applied to any environment - just in different ways. Hello Sandi, I am Carissa Watford a student at the University of South Alabama also. I have really enjoyed this post of your classroom. I like all the different centers and especially the quiet area. I know when I was in third grade that was my favorite thing, and my teacher had it set up like a beach area. I am going to be looking into some of the links that you mentioned. This gives me some ideas for my future classroom. Thanks again, I will be looking at your future posts. Hi! My name I Hannah Armstrong and I am a student in EDM310 at the University of South Alabama. I recently did an observation in a Kindergarten class. The teacher there also used number dots to help the students line up. I thought that was a great idea, and it also helped the students learn the number order. I just love you classroom, it seems like a great learning environment. I thought the cozy corner was super cute. We had one in my classroom as a child. I know that I always wanted to spend time in the cozy corner. I loved your post, and will definitely be checked back to read your other posts. Hi Sandi, my name is Monica Aldridge and I am attending the University of South Alabama this year. My major is Elementary Education. I really love how you displayed your classroom. It is a place of learning but it looks inviting and fun for the students. The dots on the floor are a great way for the students to line up. I like the way you utilized the space of the room. My name is Jennifer, and I really enjoyed taking a tour of your classroom! You're so creative, and I'm sure your students love that about you! I really like a lot of things about your room! It makes me wish I was going to be an elementary educator! I have a 6 year old, and she use to have problems with where she kept her shoes. She has gotten a lot better, but that wasn't until recently. She is in the first grade now. You're students are doing so well, and I'm sure their parents appreciate it as well! I love your cozy corner! I bet you wish you could have a little bit more space for it because I'm sure it would be beneficial! I love how you said that they can ponder life there. Do your students like to spend time there? I think the tree is super cute too! Thanks so much for sharing your classroom! My name is Jerica Baker an EDM310 student at the University of South Alabama. I love how you have your classroom set up. It is very creative and you put a lot of thought into it. I like the tree idea and it changing according to the season, again very creative. You gave me some wonderful ideas for when I have my own classroom. Thank you! Hey Sandi My name is Caleb Fleming and I am a student in edm 310 in the University of South Alabama. I personally love the cozy corner. Even though the corer is small but I believe every classroom should have. I also believe that every student should spent time in there just to reflect on the week hey have had. Students need to be sit down and think about what they have done or learned this week. Hi, Sandi! I'm another one of Dr. Strange's EDM 310 students. I'm sure by now your confidence in classroom decorating has gone through the roof! :) However, your classroom really is great. I liked seeing all of the natural elements in your centers. Pine cones, sticks, gourds, etc. Sometimes we get so excited about the newest toys and games that we forget about all that nature has to offer to a learning environment, and best of all, it's FREE! I can tell that you are a very passionate teacher and that nothing goes into your classroom that doesn't have the opportunity to teach your students in some way. Thank you for sharing your classroom with us (and reading all of our comments!). Love how warm and welcoming your classroom looks. Hi Sandi! I'm Robin Hinson, a student from The University of South Alabama in EDM 310. It's great to comment to you for a third time! I really enjoyed your post of your Classroom Tour. You have definitely made so much out of the space you were given. I love how every aspect of your classroom is put to use for something important and fun! I hope to have my future classroom looking this great as well! Like most of my classmates have said, I too love the "cozy corner." I think every student wants a chance to relax comfortably while enjoying a great book! Thank you for sharing your classroom with us! Hey! I am Callie Thames and a student in Dr. Strange's EDM 310 class at the University of South Alabama. Your classroom is amazing, I love how inviting it is. If I had a classroom like that when I was that age I would have never wanted to go home. The cozy corner and the science area were two of my favorite features in the layout/design. I can tell just by how much time and effort you have put into creating this little learning center for your students, that you are very passionate with what you do and those kids are truly lucky to have you as a teacher. Thank you for sharing this lovely classroom with us!! Hi, my name is Veronica Nall. I am in EDM310 at the University of South Alabama. I enjoyed reading and seeing the pictures of your classroom. I think you have succeeded with making your classroom a welcoming place. You had lots of great ideas but I think my favorite thing was the tree the had the balloons as leaves bases on the season. Thanks for sharing your classroom! Hi, my name is Logan Alvarez. I am currently a student at the University of South Alabama and I am taking EDM310. I am extremely glad Dr. Strange lead us to your class blog. Your classroom is adorable! If I was a student in your classroom, I would feel comfortable and ready to learn. One of my favorite areas in your classroom is the quite, cozy, corner. By seeing your classroom, I can tell how passionate you are as a teacher. I am sure students love to sit there and read. Thank you again for opening your classroom! Hi Sandi, my name is Macy Roe! I am a Junior at the University of South Alabama. I am currently in Dr. Strange EDM310. I love your classroom you have so many different activities which I think makes coming to class more fun. Your curtain idea is great I plan on using that tool in my classroom. One of my favorite things about your classroom was the seasonal balloon tree. That is super cute and creative! Thank you for the tour of your classroom, I can't wait to have a fun classroom like yours one day! I am Lauren Lee and I am an elementary education major at the University of South Alabama. I am currently in Dr. Strange's EDM310 class. I loved your classroom! The "cloackroom" being outside is a genius idea and I will most definitely have to remember that when I get my own classroom! I really enjoyed getting to view your classroom. I hope you have a great school year! Thanks for sharing your classroom. Your photos show all of the wonderful learning that is happening! I am almost ready to share my new wonderful sunny room. I unpacked my last box on Friday! Hi Mrs. Sandi, my name is Alex Grow and I am a student at the University of South Alabama as well in class EDM310. I absolutely love your classroom. Seeing all of the creative things you've done with your classroom makes me want to switch from secondary to elementary education. What a great idea you have with the calendar. I am a special education major so that is a good idea for my classroom in the future. With a calendar that stays up all year, I could give the students a chance to fill it with important dates and birthdays as an activity. You are truly an inspiration to teachers everywhere. I also hear thanksgiving just passed there. I hope everyone had a great thanksgiving. Hope you have a great rest of the year! Hello Mrs. Sandi, my name is Javious Williams and I am a student in the EDM310 class at the University of South Alabama. WOW!!! Your class looks absolutely amazing; I can tell you put much thought and effort into designing your classroom. You also have an extremely large amount of space; I can imagine how excited your students must be about coming to school. Everything looks so neat and in place, I truly wish I could become a kid again just for one day so I can attend your classroom. Thanks for allowing me to peek inside your classroom; I hope you had a great thanksgiving!!!! Hello, my name is Bailey Adams. I am in Dr. Strange's EDM 310 class. Your classroom looks fantastic ! I am considering teaching kindergarden and I would love my classroom to resemble this one. I really love the cozy corner. This looks like such a fun and warm place to read. I especially enjoyed the tree that changes seasons ! What a fun idea. Hope the rest of your year goes well . My name is Porscha Sellers and I'm a student from the EDM 310 class. I enjoyed the tour of your classroom. I love how you created a cozy corner for the students. You did well with the resources and space that you have. When I become a teacher I'm sure that I will enjoy getting my classroom together. It will give me a way to be creative. I hope everything goes well with you and your students'. My name is Robert O'Berry and I am a student of EDM 310 at the University of South Alabama. I am astonished at just how much you have done with your classroom. Not only have you worked with every bit of space to perform a function, but also how you take into consideration your student's input such as the balloon tree. Everything is much more organized than the classrooms that I remember in my earlier years, and I can just imagine watching the children having fun while also learning basic skills. I hope that you and your students have an amazing year and all goes well. Hi, my name is Marie Howard and I am a student at the University of South Alabama and I am studying to become an elementary school teacher. I absolutely LOVE your classroom. I can tell that you have really taken the time to make your classroom inviting for your students. Being a kindergarten teacher, this is probably the first time most of your kids have been in a school type-setting. I know that having a classroom that looks to be fun and colorful will help your students feel safe and welcoming on the first day. I also love your idea with the number dots on the floor for lining up. Hi, Ms. Purdell-Lewis, my name is Chelsea and I am a student in EDM 310 at the University of South Alabama. I just wanted to tell you that I love your blog. I love what you have done with your classroom. It looks so cozy and inviting! I am sure your students have a wonderful time. I really like the tree and how you change the balloon colors for different seasons. I hope you had a wonderful Thanksgiving!! Hey Miss Sandi! I am a student at the University of South Alabama. I am pursing a degree in Education. My Professor Dr. Strange told us about your post and I was amazed by the tour. You have so much creativity going on in your classroom. I think you are doing a great job with the limited resources you have and I'm sure the kids love your class. I know I would. My favorite thing would be the quiet cozy corner for the kids. As a student, I need quietness when I'm reading or trying to study. I really like that you said it's to "ponder life". I think it's really cool you care enough about your students to let them have that time to themselves. I think you are a great teacher to look to for ideas. Thank You! Hope you had a great Thanksgiving! Hi Sandi! My name is Raven Williams and I am a student in EDM310 at the University of South Alabama. I really love what you have done with your classroom! My favorite part was the cozy corner. It looks like the perfect place to read a good book. I also like the idea of the line dots. I know getting students to line up can be hectic and this looks like a perfect fix for that. Thanks for sharing your classroom! Hello Mrs. Sandi! I am also a student at The University of South Alabama working on my Elementary Education degree. I really enjoyed looking at all of the pictures of your classroom. You have put so much character and creativity into everything! It definitely looks like a comfortable and fun place to learn. I look forward to reading more of your blog! I hope you enjoyed your Thanksgiving! Hi Sandi! My name is Sammi Taylor. I am a student of Dr. Strange's EDM 310 class at the University of South Alabama. I will be summarizing my visits to your blog with a post to my blog on 11/09. My twitter address is @PoiseRed. I really enjoyed touring your classroom! It is very inviting and full of creativity! I really liked when you stated it is for the students and their families. Incorporating families is a great way to keep them involved into their child's learning journey. I also liked how each station is designed to promote and enhance a skill that students can carry with them throughout life ie the house and scissor practice sand table. Thank you for sharing your classroom. I hope you had a great Thanksgiving! Have a great year! Hello! My name is Callie Barton and I am an elementary education student at the University of South Alabama. I first want to thank you for opening up your doors and sharing your wonderful classroom with us. It made me feel so excited about my future classroom and my ideas started running wild! You have a ton of supplies in your room and it is all beautifully organized. Some of the many things I really liked about your classroom is that there are books everywhere, a cozy reading corner with a lamp, rug, and pillows, "line up" numbers, comfy chair, science area, and my all time favorite the "house" area. I don't remember much from kindergarten but I do remember the "house" area in our classroom. It was my favorite activity! The "line up" numbers are a wonderful idea that has a dual purpose of structure and learning. I may have to "steal" that idea when I become a teacher. I thoroughly enjoyed taking a virtual tour of your classroom and thanks again for allowing us to. I also wanted to say that I hope you all had a fantastic Thanksgiving holiday! My name is Mia Britton and I am Elementary education major. I enjoyed the pictures of your wonderful classroom. You appear to be a very hands on teacher. I'm sure your students enjoy you as a teacher. I love to have an opportunity to visit your classroom. Happy Thanksgiving and thank you for sharing your classroom. Hello Ms. Sandi, my name is Hunter Tallent, and I am a student of EDM310 at the University of South Alabama. I'm sorry to arrive late to the comment party, but I must say that I agree with the general consensus. Your classroom is incredible. You can feel the passion that you possess for education emanating from the attention that you have put into your design. I wish you nothing but the best of luck in the coming school year, and I also wish you a happy late Thanksgiving. My name is Felicia Grantham. I am a student at The University Of South Alabama studying Elementary Education. I loved seeing the pictures of your classroom. You seem to be the kind of teacher I am striving to be. I love to see teachers passionate about what they do. Thank You for sharing. Happy Late Thanksgiving! Ours is coming up very soon, sometimes we call it "Turkey Day" Hope you enjoyed it! I am in love with your classroom. The warm cozy feelings it gives off seems so inviting, and i'm not even a kid. I also really like how every space was used with a purpose, I imagine your students are very lucky to have a teacher with such a cool classroom, thanks for sharing it, I'm always interested in peeking in and getting ideas for the future. © 2016 rubber boots and elf shoes. Natasha Template designed by Georgia Lou Studios customized by Grade ONEderful Designs All rights reserved.